Avocado Toast doesn’t have to be something to only enjoy at breakfast! 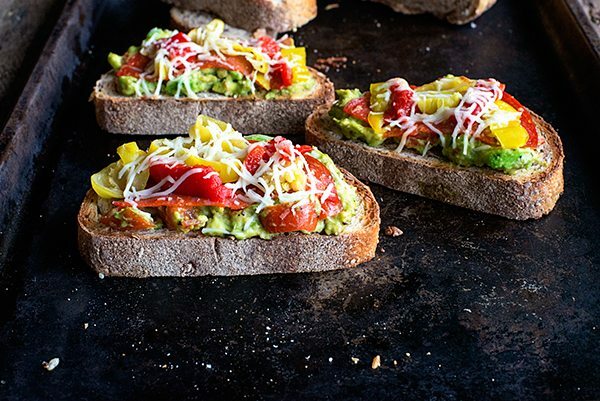 Give this Lunchtime Avocado Toast recipe a try. Topped with fresh, California Avocados, tomatoes, pepperoni, banana peppers, roasted red peppers and cheese, it’s sure to be a lunchtime hit! Avocado Toast has become all the rage lately, hasn’t it? For good reason! 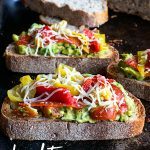 A thick slice of hearty bread toasted and topped with California Avocados and a myriad of other favorite toppings is about as good as it gets when it comes to really great food. Plus, Avocado Toast is so easy to customize to anyones liking. It’s no wonder people are turning to it during mealtime. I’ve been visiting a local coffee shop lately known for serving incredible Avocado Toast. The problem is, I’m always hungry for it at lunch time, but they only serve the toast at breakfast. I think that’s a shame. In my opinion, Avocado Toast should be an anytime of day meal! What’s a foodie to do with a lunchtime toast craving and no where to curb it? 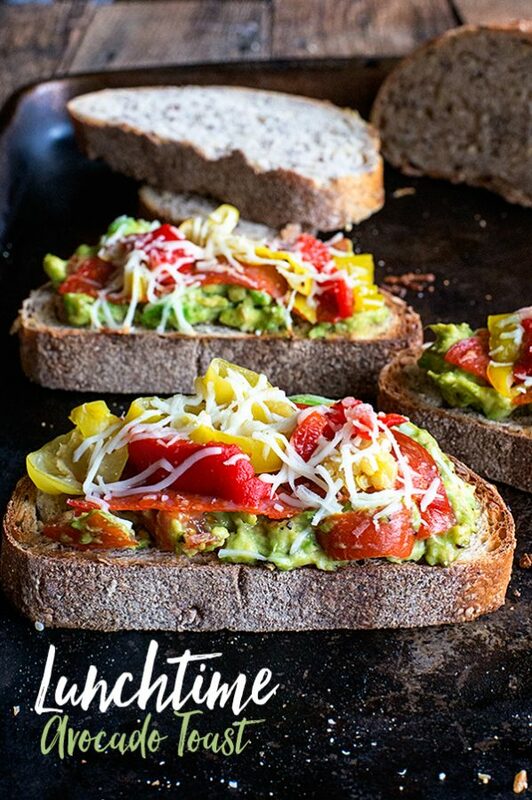 Well, create a lunchtime toast, topped with California Avocados and an abundance of flavorful toppings, of course! Now, I can have this lunchtime favorite whenever I want, even when the coffee shop menu says otherwise. It’s ready in just a matter of minutes too – perfect for lunch! I’m sharing the recipe with you today so you too can enjoy delicious this delicious lunch at home. California Avocados are now in season (yay!) so pick up some today and give this recipe a try. 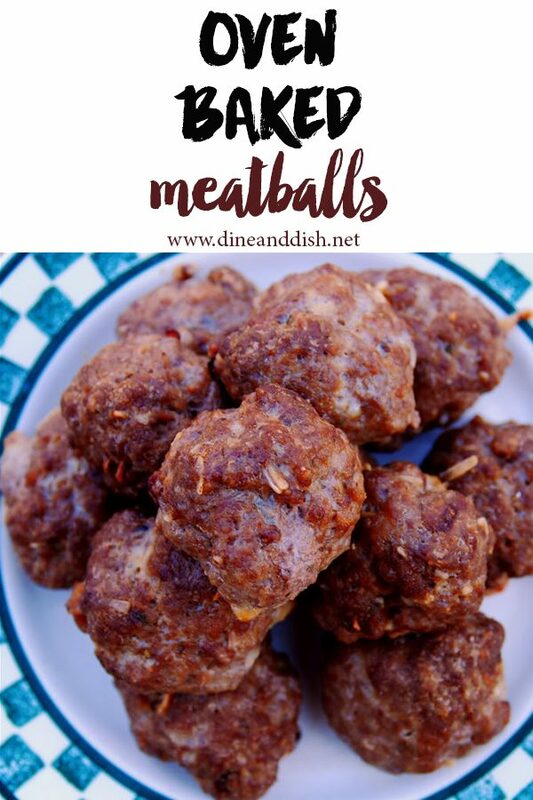 It’s a quick, simple, flavorful solution for breakfast, lunch or any meal in between. Enjoy! Avocado Toast isn't just for breakfast! Give this simple lunchtime toast recipe a try! Place bread in toaster and toast until light brown. Meanwhile, in a small bowl, slightly mash avocado with a fork. Stir in tomato, Kosher salt and black pepper. Place toast on a cookie sheet. Evenly distribute smashed avocado mixture and spread on each slice of toast. 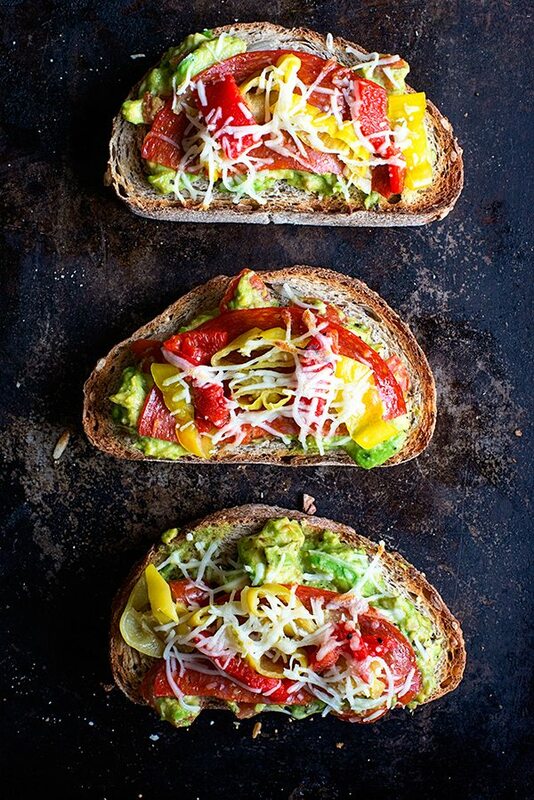 Top each avocado toast with one pepperoni halve, banana peppers, roasted red pepper and mozzarella. Place under broiler for 1-2 minutes, or until cheese is melted. Serve and enjoy! Disclosure: This is a sponsored conversation on behalf of California Avocados. All opinions expressed are my own. For more quick and easy recipes featuring California Avocados, please visit their website recipe page. Hi, did I miss the link with the actual recipe? I see that you mention it can be customized with any toppings that you like, but I never saw an actual recipe with the procedure for mixing the avocado (with what?) to make the base for the toast. What bread do you use? What temp and for how long do you bake the toast? Oh my goodness – that’s so strange! It disappeared. Thanks for letting me know! I’ll go try and see what the heck happened! OK that was so strange! I’m sorry about that…the recipe is updated now! Thanks so much for letting me know. I’ve never had that happen where the recipe has just disappeared before! Kristen, thank you so much for the quick reply. We’ve made a version of avocado toast for many years, but yours was so colorful and pretty, I wanted to make sure I made a copy of it. Thought it would be great to have when company is around (or not!) Thanks again. 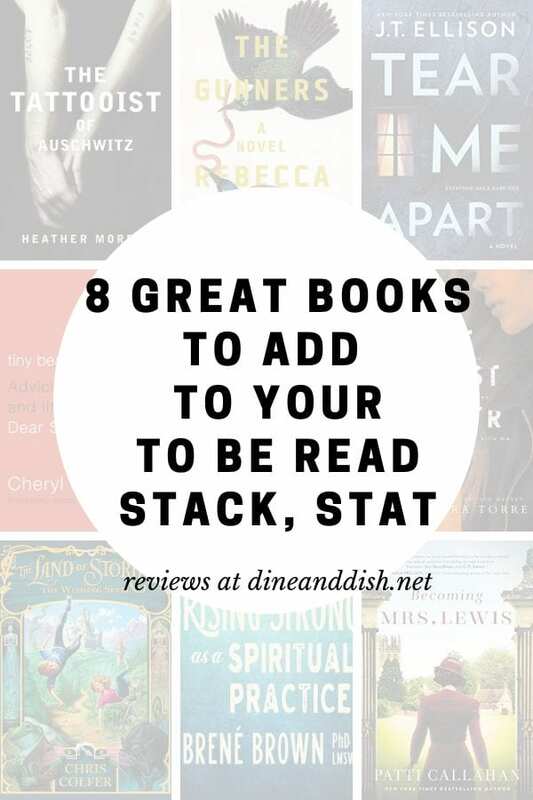 I can’t wait to look through your other recipes. I just “found” your blog today and subscribed, so I’ll be checking it out regularly. I so appreciate you bringing it to my attention that the recipe was gone! That was crazy. It’s so nice to meet you and thanks so much for your kind comment! Enjoy! Such a great idea for a party. I want to use a French loaf and slice it up, toast it and use your Avocado recipe. Thanks so much for the inspiration!! I love the colors on that toast. So bright and appetizing. And the taste of avocado and roasted pepper together is just lovely. What a great way to bump it up a notch! I’m glad I’m not the only one who thinks that avocado toast isn’t just meant for breakfast. This would be much more filling and make a great lunch! Thanks for sharing.